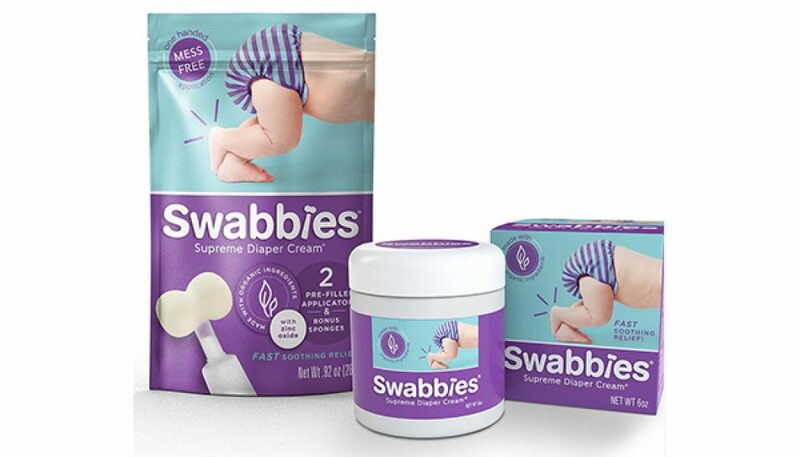 Swabbies, a new organic diaper rash cream in a single-hand applicator helps prevent changing table falls. During the first year of a baby’s life, he will have his diaper changed about 2,400 times. That’s a lot of time on the changing table, and studies show that changing tables, beds, and high chairs are the most common places for infant falls to happen. Falls account for over 50 percent of nonfatal injuries for infants, and the most common injuries are head injuries, fractures, sprains, contusions, and bruises. Traditionally, two hands have been needed for the application of diaper cream, which increases the risk of the baby falling during the process. Diaper cream is also typically messy to apply, particularly to a moving baby. “I knew there had to be a better way,” Campbell says. “I needed something quick, easy, and mess-free that was also safe and effective. So Campbell developed Swabbies out of necessity after desperately seeking a diaper rash cream that allowed her to have a free and clean hand while changing her baby’s diaper. Swabbies has a single-hand applicator making it possible to have one hand free to control the baby’s movements, while the other hand applies the cream to the affected area. Swabbies is an herbal diaper rash cream made from organic materials such as grape seed oil, olive and tea tree oils, beeswax, shea butter, and lavender in a container with a single-hand applicator. To promote rapid diaper rash healing, Swabbies also contains the maximum amount—40%—of non-nano zinc oxide.